Many people have an idea of what Forex Traders are, either from hear-say or news of another Forex millionaire teenager. But what really is within the real profiting Forex traders? As an ex-Forex day trader, and knowing a handful of profitable Forex traders, I have narrowed their traits down into a short list that are likely the cause that have made them a winning trader. From being as weird as spongebob, to being reckless, here are the 6 inside traits that you will want to know about them. We all have this one friend who is crazy and reckless in whatever he or she does. If you don’t seem to have one, it might just be you! Think about it: Who actively tries to defy odds even when so many studies and statistics have proved that as high as 95% Forex traders lose money in the long run? 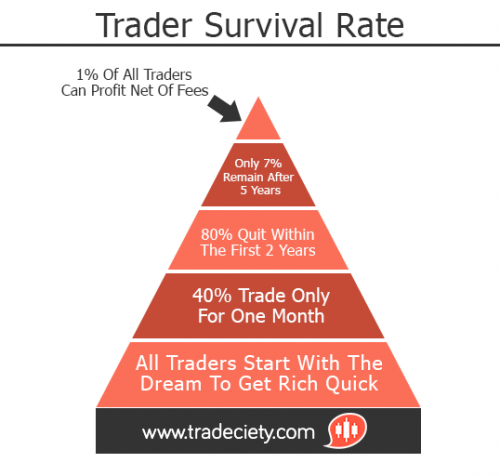 Look at the Trader Survival Rate pyramid drawn by tradeciety.com below. Look at this, this, this and this. Hence it is true that Forex traders are reckless in nature, and the successful ones are those who found the optimal balance between being reckless and having self-control. They are usually task oriented people, if not extreme. Instead of celebrating winning trades like what results oriented people will do, they celebrate when they beat their own past record of consecutive trades of not breaking their trading rules, regardless if the last trade was a winner or loser. From my experience, those who are results oriented usually end their trading career pursuits within their first years of trading. Successful traders all trust their systems and know their game well that their trading edge will always play out as long as they follow their plans. All new traders will experience agitation when running a live trade that paralyzes their ability to think logically since it is just natural human instinct of responding emotionally. This is why I emphasize on having a solid trading plan and have it created during market close hours, when emotions are neutral and logical thinking ability at its maximum. On the contrary of what most people think, Forex traders are not gods. Even with years of trading experiences, they still do feel pressure and stress both before and during a trade. It’s just that they love the tension and work even better than when there’s not. They are just a different species altogether. In Forex trading, there will be times when there is a string of twenty losses and you still have to keep your cool and start again as though nothing happened. Ask around. All successful traders will have this trait but unfortunately if you’re not with it, I doubt it could be tamed even with ten years of trading. I know a Forex trader who day traded the Forex market full time for more than 7 years and he always tell us that he has never personally mastered the market. He just learned to work hand in hand with the market. Mind you, that is a 16,380 hours of participating the market live (not including off-market review and self-practicing)! Calculated by 9 hours a day, 5 days a week, 52 weeks a year, for 7 years. That might even be greatly underestimated, as I am sure he trades more than 9 hours a day, since the FX market is on 24/5. The Forex market is a magical market. Whenever you think you’ve learned it all through the ups and downs and reading trading forums and 56 Forex books and $22,000 seminars, the market always manages to prove you wrong. And then you learn more. Its characteristics, patterns, volatility, reactions to news, etc. And then, the trader still has to learn his own personality, emotions, self-control, recklessness level, etc. It never ends. As reckless as they are, Forex traders who have traded for at least a year will all know that the market won’t care how much they’ve lost or won the day before, nor if they’ve sat in front of their screens since 4AM. Market always continue to do what it is doing (either going up or going down) and will not empathize nor bow down to anyone. This means when you try to squeeze profits out of the market by forcing your views on the market, chances are you that you become more desperate and will trade any minute opportunity that comes by. To a normal person, everything you thought you knew about them plus the above 5, it might seem like it is impossible (or extremely hard) for any human being to achieve success in Forex trading in the long term. Knowing that, they still went ahead and is determined to succeed. To me, this is enough of a reason they will be achievers of the impossibles in life. As they say, to be number one, you have to be odd. With all the above, Forex traders are a unique being who are always looking to improve themselves. They are the weird ones in class or work. Those one who thinking different, act different, value things different and work different. If at least three of these 6 traits strike you, you might want to give Forex trading a try. Who knows? It might be your eternal calling haha. I guess if after reading these and you still want to give it a try, you’ve won half the battle. Do I feel battered on reds? Thank you for your comment. Give it a try! You might like it! Do you trade other instruments? A very well written piece of article that describes us! That’s true, so many Forex traders struggle for years and if you talk about long term it is very difficult to make money with Forex trading.